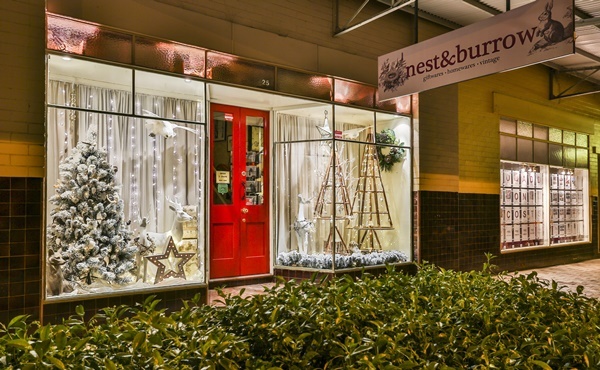 In the small town of Bundanoon in NSW’s Southern Highlands, Jacki Sinnett’s gift and homewares store Nest and Burrow has become known for its creative window displays, particularly at Christmas. 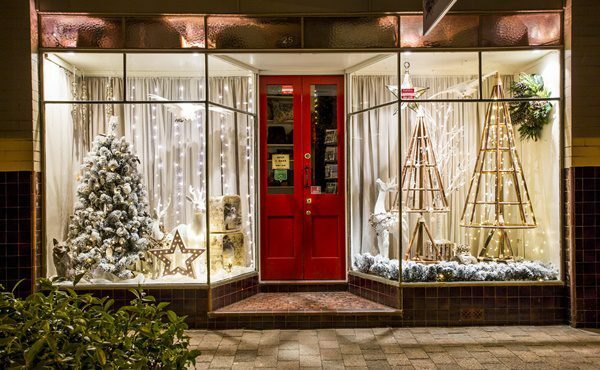 Since opening in 2012, Sinnett has gone all out for the season, with the store’s two windows being taken over by festive looks. Giftguide spoke to Sinnett about her fabulous displays and merchandising for this time of year. First, how would you describe your 2016 Christmas windows? [They are] quite natural this year. The centrepiece is a Delight Décor snow fir tree that helped to create a white and timber look. The theme is drawn together with white deer and owls. When do you begin Christmas merchandising? We have a huge garden festival in town towards the end of October, so for us it is imperative to get it in before that weekend to maximise exposure. I think mid-October is good timing in general. What is your timeline for planning and installing your festive displays? We begin shopping for Christmas in February at showroom events as well as the February gift fair. What we see determines the look we will choose. Some stores pick one theme and run with the one look [but] we try to cater to different Christmas tastes. While white and natural is our main theme this year, we still have a green tree with traditional decorations as well as lots of different mini themes so there is something for everyone. We create our Christmas look in one day. We pre-price as much as we can, then on the chosen day four of us work from 8am until 8pm, then my husband and I work to complete both the windows and the Christmas room, usually until 4am. When the shop opens it is like the elves have been and the whole display is done. How do you carry the Christmassy theme throughout your store? We empty out a significant part of one of our rooms and install a full Christmas theme… We also play Christmas music in that room. What reaction do you get from your local community to the displays? We have had locals asking for a month prior when Christmas is coming. We have lots of small nose and face prints on our windows from all of the children visiting to see the displays, especially at night with the lights. Last year we won a competition from the Southern Highlands Chamber of Commerce for the best Christmas window in Bundanoon. What tips would you give to other retailers creating their Christmas look? Create a look that is unique to you. You need at least four different suppliers featuring in your displays so that you don’t look like anyone else—it will be your unique mix… It’s an enormous amount of work that pays off when it reflects your own style. Also, big pieces create a big impact and remember to light up your windows at night. Our lights are on timers and come on from 6 to 10pm. Your windows are always really creative, not just at Christmas. What do you enjoy about merchandising? Is there anything you dislike? Our windows are really the drawcard for our store. The ever-changing display lets locals know of new stock, and shows tourists that we carry more than what they can just see in the door. Some windows come really easily to me—I get an idea and can pull it together in half a day—while other times it is really hard and can take me a long time with lots of trial and error. Some windows turn out better than others as it depends on what is being showcased and that’s ok too. I enjoy the responses I get from people. I get lots of amazing feedback and the windows have really become a showpiece in the main street of our small town. The only thing I dislike, I suppose, is that it creates a bit of pressure—everyone’s expectations of each window display are high.